The reduced concentration, slower reaction time and impaired decision making that result from insufficient sleep can have serious repercussions for process safety, Koos Meijer, a Human Factors Consultant with KM Human Factors Engineering & Somnoblue, said at the 2016 IADC Human Factors Conference in Galveston, Texas. 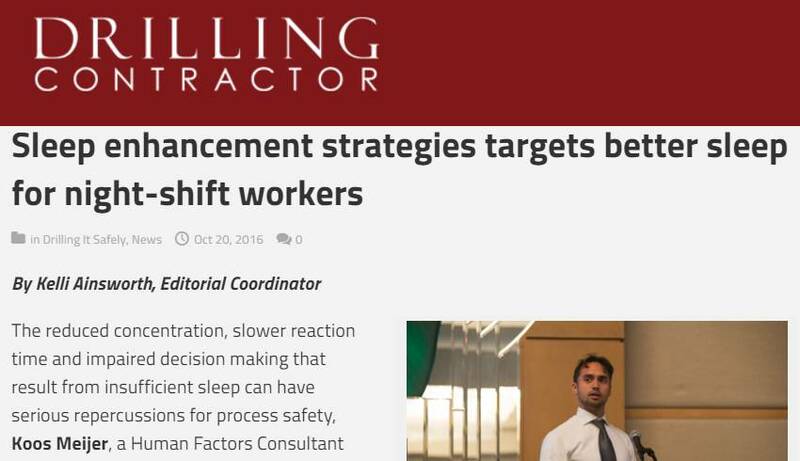 Because the brain produces hormones to make us feel alert or tired based on light, night-shift workers – who can be found on every working drilling rig – are particularly vulnerable to poor-quality sleep. “Our body finds it hard to completely adapt to night work schedules because of these inconsistent light cues,” Mr Meijer said in his presentation on 4 October. KM Human Factors Engineering took its cue from NASA, which implemented a light treatment system for its own night-shift workers, and applied it to the offshore oil and gas industry. Sleep concentration, problem solving, memory and communication. Night-shift workers are especially likely to have trouble sleeping due to circadian misalignment, Mr Meijer said. Receptors in the eye detect blue light, which tells the brain that it’s daytime. “During the day, it produces hormones that keep us active, such as stress hormones,” he said. However, at night, when very little or no blue light is detected, the brain produces melatonin, which enables sleep. “This hormone is allergic to light,” Mr Meijer added. “I call it the Dracula hormone.” Artificial light offshore rarely exceeds 500 lux, Mr Meijer said, while daylight, even on a cloudy day, typically surpasses 2,000 lux. Therefore, when night-shift workers are exposed to very little blue light during their shift, the brain wants to produce melatonin. The reverse is true at night – when a worker is exposed to lots of blue light before trying to go to sleep, they have trouble falling asleep.